I recently picked up 'Mediterranean' from Barry M's Aquarium Collection, which consisted of six nail polishes - four multichromes and two glitter toppers. 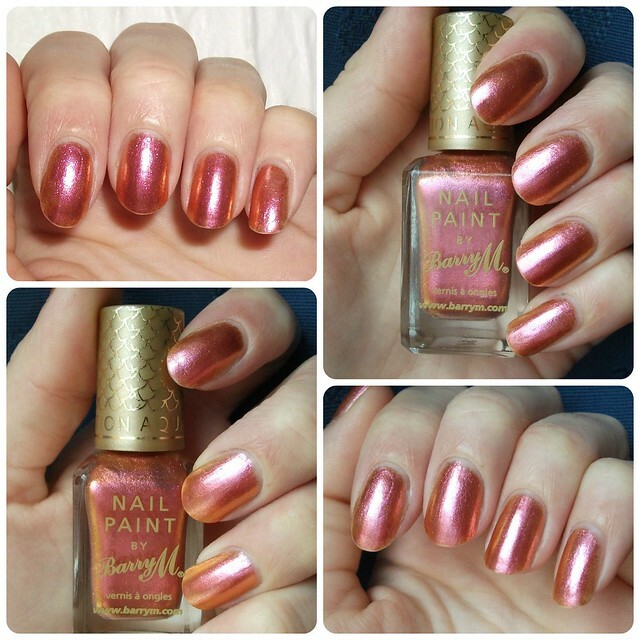 'Mediterranean' is a pinky-gold-bronze multichrome polish which shifts in colour dependent upon the light. I applied two coats over a base of OPI's Nail Envy; I haven't used any top coat in these photos to show how the polish dries to a super-shiny finish even without top coat. Application was pretty easy, with the first coat being quite sheer but the second bringing it up to opacity, with a lovely smooth finish and quick drying time. I only wore this for a day but didn't experience any chipping whatsoever. I love the scales on the gold lid! 'Mediterranean' is a lovely summery shade which I've also got on my toes at the moment, it'd be beautiful with a tan and because it's multichrome, it really does come to life in the sunshine! Did you pick up any polishes from the Aquarium Collection? What do you think of 'Mediterranean'? Do you like multichrome polishes or do you tend to favour block colours? Polishes in the Aquarium Collection are priced at £3.99 each and are available from Boots & Superdrug. PS, Don't forget to enter my 500 Follower Bloglovin' Giveaway to be in with a chance of winning a mystery box of beauty goodies!! This looks so pretty! A fantastic shade for all times of year! Lovely shade, I love the Barry M gel nails.